The controversial ‘MiG Deal’ remains in the public spotlight as evidence continues to surface of the Rajapaksa Government’s complicity in engineering the dubious 2006 arms deal, and of scandalous attempts to hide the truth of the deal from the public. Sunday Times Defence Correspondent, Iqbal Athas, who first exposed the alleged scam in December 2006, has now revealed that his reporting on the ‘MiG Deal’ led to the withdrawal of security, overt death threats, and a brutal state-sponsored campaign to identify and silence his sources. In his keynote address at the opening of the Centre for Investigative Reporting (CIR), Athas spoke publicly for the first time about the price he and his family had to pay for his reporting on the MiG deal. “Just two weeks before Lasantha Wickrematunge was murdered, a very highly placed source asked me to flee the country. That very night, I flew to Thailand,” the senior journalist recalled. “The next morning, my driver saw a man in an oversized bush shirt riding a motorcycle outside my house. There was a pistol in his waist-band.” Athas pointed out that when he checked the registration number of the motorcycle, he found that it was registered to a lorry. Two weeks later, on January 8, 2009, Lasantha Wickrematunge, whose sequential exposes on the ‘MiG Deal’ had led to a defamation lawsuit by the then Defence Secretary Gotabaya Rajapaksa, was murdered by a motor bike squad which intercepted his vehicle and attacked him on the street. In Wickrematunge’s murder investigation also, the license plate numbers associated with the motor cycles led to dead ends. Wickrematunge’s daughter, Ahimsa Wickrematunge has told the CID that her father believed he would be killed by Gotabaya Rajapaksa to cover up the ‘MiG deal’, a fact that the CID has reported to the Mount Lavinia Magistrate’s Court. Rajapaksa has repeatedly denied any foreknowledge or complicity in the murder. He has accused his army commander, Field Marshal Sarath Fonseka of masterminding the killing, and stated that he did not investigate or prosecute Fonseka for this crime while he was Defence Secretary as he did not want to gain political mileage against his own former army commander. Last month, in an article published to mark the ten-year anniversary of her father’s murder, Ahimsa Wickrematunge drew the public’s attention for the first time to a television interview given by Gotabaya Rajapaksa to Derana TV in August 2007, in which he discussed the ‘MiG Deal’ extensively. The young Wickrematunge drew the CID’s attention to this video interview because of a passage in which the former defence secretary speaks, in the context of the MiG deal, about journalists who criticise him being able to drive themselves around freely in their cars without anything happening to them. The slain journalist’s daughter believed that the interview could be a key piece of evidence for the CID. On January 7 2019, the CID obtained a production order from the Mount Lavinia Magistrate’s Court to compel Derana TV to produce the original archive footage of the interview with Rajapaksa. Ten days later on January 17, the CID informed the court that Derana had failed to produce the recording of the interview. A Derana official told the Sunday Observer that they only received the court order last week and are in the process of locating the video footage. “Once we locate it, we will hand it over to the court,” the official said. The Sunday Observer has obtained an excerpt of the interview in which Derana anchor Dilka Samanmali extensively questions Gotabaya Rajapaksa about his involvement in the ‘MiG Deal’. Rajapaksa laments to the interviewer that the media coverage of the ‘MiG Deal’ was part of an effort to accuse him of personally having “pocketed” a commission on the transaction, or of “someone else from the so-called ‘Brothers Inc’ (Sahodarasamagama)” having done the same. “For me to have obtained a portion of the money, I have to have used my influence,” he says, denying that he did so at any stage of the deal. “Where the MiGs will be purchased from was a decision made by the Air Force,” Rajapaksa said. “If I were to bring a proposal and tell the Air Force to buy a particular item, on such an occasion it might be said that I did that to earn money, but in this instance no such thing happened,” the then Defence Secretary insisted. Investigations by the Sunday Observer have raised serious questions about the veracity of this claim. There is no denying the Defence Secretary’s claim that the Air Force and its commander, Donald Perera, were enthusiastic about increasing the size of the Air Force’s squadron of MiG-27 aircraft. As far back as May 2005, six months before Rajapaksa took office as Defence Secretary, Perera had written to the Defence Ministry urging the procurement of additional MiG-27 aircraft. However, the air force commander was wary of unsolicited proposals, such as the one received from Ukrinmash the previous year which had been rejected by a tender board. “I am of the view that instead of obtaining another proposal, a tender with adequate publicity should be invited, which may be more advantageous in procuring suitable aircraft to the fleet,” Perera suggested. The Air Force commander repeated this request to incoming Defence Secretary Gotabaya Rajapaksa in writing in January 2006. He wrote to Rajapaksa requesting “that approval be granted for the SLAF to procure four additional MiG-27 aircraft through normal tender procedure.” However, instead of normal tender procedure, the air force commander found himself summoned to the office of the Defence Secretary on February 6, 2006 for a meeting with Rajapaksa, his cousin Udayanga Weeratunga and officials of Ukraine’s Ukrinmash. After this meeting, Donald Perera gave up his crusade for a “tender with adequate publicity” or “normal tender procedure” that would have allowed for multiple competitive bids to be obtained as when MiG-27 aircraft were purchased in 2000. Instead, he accepted the unsolicited proposal from Ukrinmash, and wrote a letter “requesting” the proposal so that it would not be considered unsolicited. This was a proposal to sell four MiG-27 aircraft at US $ 2.5 million each and to overhaul four existing air force craft between $860,000 and $1.14 million per aircraft. Once the proposal had been formally received by the Air Force “through the Ministry of Defence”, the Defence Secretary called for the appointment of a Technical Evaluation Committee (TEC) to evaluate only this single proposal for the purchase of MiG-27 aircraft without calling for or seeking similar proposals from other bidders through a normal tender procedure. While this TEC was appointed to evaluate the purchase and overhaul of MiG aircraft, at Rajapaksa’s request, there was an impediment to the TEC evaluating the overhaul proposal. At the time the TEC was appointed, on February 21, 2006, there were already separate tenders underway for the overhaul of the Air Force’s MiG aircraft. This is a fact that Rajapaksa himself was acutely aware of, as he was a member of the Cabinet Appointed Tender Board (CATB) supervising those overhaul tenders. That CATB had met on January 20, 2006. According to the minutes of that meeting, the board recommended that the Cabinet “cancel the tenders and call for a fresh proposal from the Indian overhaul facility M/s HAL on a Government to Government basis.” This is a recommendation that Rajapaksa ignored. The Cabinet memorandum dated March 21, 2006 drafted by the Defence Ministry for Minister Mahinda Rajapaksa’s signature reached a different conclusion. By the time the Cabinet approved this recommendation on April 6, 2006, Rajapaksa had already received the unsolicited proposal from Ukrinmash and his cousin, passed it on to the Air Force and sought and obtained the assistance of the National Procurement Authority to appoint a TEC to evaluate the Ukrainian proposal alongside one from the Indian firm, M/s HAL Aerospace. The TEC, with no competing bids to evaluate for the purchase of MiGs, on April 26, 2006 recommended that the Air Force proceed with the Ukrinmash proposal, despite the aircraft being older than those purchased in 2000 and being significantly higher priced. An interesting feature of the TEC report was the disparity in detail between which the report described the “Financial” components of the Ukrinmash proposal from Ukraine and the HAL proposal from India. This section of the report about the Ukrinmash proposal makes no reference as to whom the payment would be made. In contrast, the description of the Terms of Payment to HAL says specifically that funds are “to be paid to HAL” even going so far as to specify the bank in India that would receive the payment. In fact, the purported “Ukrinmash” proposal made clear from the outset that funds were to be paid not to the Ukrainian Government but to an unnamed third-party whose identity would be revealed before signing a contract. This fact was delicately omitted in the TEC report. Had it been included, it would have drawn scrutiny to the fact that the proposal was not one between Governments, but one in which it was very clear that a third party would benefit. The CATB, which included Gotabaya Rajapaksa, Nation Building and Development Ministry Secretary M.S. Jayasinghe and Deputy Treasury Secretary S.B. Divaratne, took up the TEC report at its meeting on May 5, 2006. Of the three members of the CATB, Rajapaksa, who had received the initial proposal, was the only one who was privy to the fact omitted in the TEC report, that payment was to be made to a third party. The CATB report too, omitted the fact that payment was to be made to a third party, couching the deal instead as a strictly Government-to-Government affair. Indeed, Rajapaksa presented the CATB report to Cabinet, requesting, and receiving Cabinet approval to proceed with the Ukrinmash proposal “as applicable under the Government to Government transaction”. This was not the only way in which this proposal misled the Cabinet of Ministers. Over two weeks after the CATB had concluded its decision to recommend the Ukrinmash proposal to the Cabinet, Ukrinmash Director D.A. Peregudov wrote to the Air Force to inform them that the engines that had been offered in their proposal “for installation in MiG-27M aircrafts have been sold to another foreign customer.” Peregudov instead proposed four different engines that had not been earlier proposed to the Air Force, evaluated by the TEC or recommended to the CATB. Nevertheless, this material change in the goods being offered was never notified to the Cabinet by the Defence Ministry. When the contract was finally signed in July 2006, only then was the beneficiary of the payment identified, a company named “Bellimissa Holdings Limited” with a London address and fax number that were never verified by the Air Force or Defence Ministry. According to Iqbal Athas, barely two months after the contract was signed, “In September 2006, a source in the Sri Lanka Air Force gave me a bulky document – a so-called contract for the procurement of four MiG-27 fighter jets.” Athas said he investigated the matter for many weeks, discussing it with his sources and diplomats who specialized in defence and security. “A clear picture emerged,” he said. In response to his expose, Athas said, “powerful persons with a bottomless reservoir of arrogance, vengeance and vendetta unleashed a campaign of terror on me.” The Ministry of Defence officially branded Athas as a ‘traitor’ in public statements. His security was withdrawn and he came under government surveillance. “I knew that someone somewhere was deeply hurt by my embarrassing disclosures,” Athas revealed. In July 2007, The Sunday Leader and Lasantha Wickrematunge struck yet another blow to the legitimacy of the MiG deal, by reporting that “Bellimissa Holdings Limited”, the company to whom the Air Force eventually paid nearly US $15 million, did not exist in the United Kingdom. Bellimissa, Wickrematunge reported, had used a fictitious London-based mail forwarding address and fax number in its contract with the Air Force. Rajapaksa also defended the price difference by pointing out that the aircraft purchased in 2000 came with a lifespan of two years. The ones purchased in 2006, Rajapaksa stressed, had a lifespan of eight years, which justified the substantial price hike. A study of documents connected to the ‘MiG Deal’ by the Sunday Observer, however, reveals that the devil is in the details. The six cheaper, newer aircraft that were purchased in 2000 were given to the Air Force with a service life of 750 to 850 flying hours over a one to two year period. This meant the aircraft would require overhaul either after being in the air for 750 to 850 hours, or after being in service for a one to two year period before they would require another overhaul. The contract indicated that the Air Force intended to use the aircraft for up to 100 hours a month. The aircraft purchased in 2006, however, which would be freshly overhauled, would have a service life of eight years instead of one or two, before an overhaul was required, exactly as Rajapaksa claimed. However, the number of flying hours available was in the same range as the aircraft that were purchased in 2000. Each could be flown for up to 850 hours. However, the new aircraft could spread this flying time over eight years. 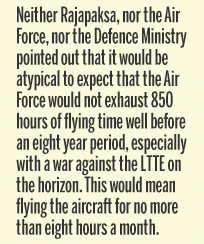 Neither Rajapaksa, nor the Air Force, nor Defence Ministry pointed out that it would be atypical to expect that the Air Force would not exhaust 850 hours of flying time well before an eight year period, especially with a war against the LTTE on the horizon. This would mean flying the aircraft for no more than eight hours a month. The engines too, came with a lifespan of only between 500 and 550 flying hours before overhaul, in both 2000 and 2006. The calendar time between overhaul for the engines was given as seven years in 2006, instead of two years in 2000. Again, to last seven years, the engine would have to be used by the Air Force for no longer than six and a half hours a month, which was an extraordinarily unlikely proposition. Another new feature of the 2006 contract that was absent in the 2000 contracts were certain caveats to the service life guarantee of the aircraft. While in 2000, there were no loopholes around the guarantee of calendar life or flying hours, the 2006 contract contained a clear asterisk. Clause 13.4 of the 2006 contract pointed to a “List of components with Time Between Overhaul different from that specified in points 13.1 and 13.2 provided in Annex 4” to the contract. This was another dimension of the deal that was not considered by the TEC, CATB or the Cabinet of Ministers. Some of the components listed in Annex 4 of the contract include the landing gear, shock absorbers, wheels, brakes, anti-skid detectors, fire warning system, piston pumps, hydraulic boosters, aircraft starter generator, oxygen regulator, temperature regulator and the guns. Had more bids been obtained for additional entities, such discrepancies would have been clear to the officials evaluating the proposal. The month after the Derana interview, in September 2007, Wickrematunge and The Sunday Leader reported on the degree of Rajapaksa’s involvement, from the fact that the then Defence Secretary had initially received the proposal with the involvement of his first-cousin Udayanga Weeratunga, and that several regular procurement procedures had been bypassed. In response to these articles and mounting pressure from the Opposition in Parliament, the government pledged to appoint a Parliamentary Select Committee to examine the MiG deal. However, the committee never materialised. Instead, in response to these articles, Gotabaya Rajapaksa sued Wickrematunge and his newspaper for defamation. It was on the eve of the defamation trial in the Mount Lavinia District Court, that Athas was warned to flee the country, and Wickrematunge was killed. The MiG deal largely stayed out of the news until 2015, when Iqbal Athas made a statement to the Police Financial Crime Investigation Division (FCID), whose investigation has vindicated much of Wickrematunge’s and Athas’ reporting. The FCID has reported that Weeratunga was directly involved in the deal and named him a suspect. Sleuths have also exposed the Singaporean businessmen behind Bellimissa Holdings and found the shell company’s corporate roots in the British Virgin Islands. The FCID also visited Ukraine and obtained evidence from the Ukraine government, who said they never entered into any agreement with Sri Lanka in 2006 to sell or overhaul MiGs. The contract signed by the Air Force was a forgery. The Ukrainian government had sold the MiGs to the Singaporeans T.S. Lee and Ng Lay Khim, who had provided them to the Air Force. The Ukrainian government has told the FCID that they were paid just over US $1.2 million per aircraft by the Singaporeans, or half of the US $2.4 million that the Air Force paid to Bellimissa Holdings for each aircraft. The FCID is investigating who profited from this 100% commission on each MiG.